Walmart’s announced its latest move to help leverage its chain of stores against Amazon.com. The behemoth retailer has announced it has a new way in which it will handle its in-store returns of purchases made online that it says could help to shrink the processing time to only 35 seconds. Beginning in November, customers can start a return process on the Walmart app prior to brining in items they are returning to any of the company’s 4,700 stores. 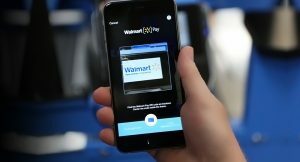 When at the store, the customers then can scan a barcode with any compatible mobile electronic device and hand the returned items over at a dedicated lane of the customer service area, in what an executive at Walmart said would take only 30 seconds, or far less than what it currently takes. Walmart added that it would also lessen the amount of time it takes for customer’s to be refunded. The new program, Mobile Express Returns, has been set up to handle products sold as well as shipped through Walmart.com and that would exclude any third-party sales on its marketplace online. Express lanes at customer service already exist, as they were out their earlier in the year to help speed up its pharmacy and money service clients. Walmart it also planning to add to the service in 2018 items bought in stores. As well as Walmart hoping this will help improve its customer service, the effort is a way for the retail giant to edge past Amazon, which had not been idle itself. Recently Amazon entered into a deal with retailer Kohl’s where 80 locations of Kohl’s would handle returns for the online giant. In addition, Amazon will handle some returns at its new Whole Foods locations that it recently acquired. As well as launching the returns app in November, Walmart, starting during December, will allow customers to keep certain online ordered items that the retailer would have had to throw away of they were returned, such as makeup that is opened or shampoo that had been damaged in delivery. Shoppers can scan those items with their electronic mobile devices and receive an instant refund and do not have to go to any store to do so. The country’s largest retailer said it was building in significant safeguards that would prevent any abuse of that new service by its online customers.